Fed Raises Interest Rates Again As Economy Rolls On : The Two-Way Policymakers increased a key rate for the third time this year. The quarter-point move indicates the Fed is confident in the economy as it continues to recover from the financial crisis. 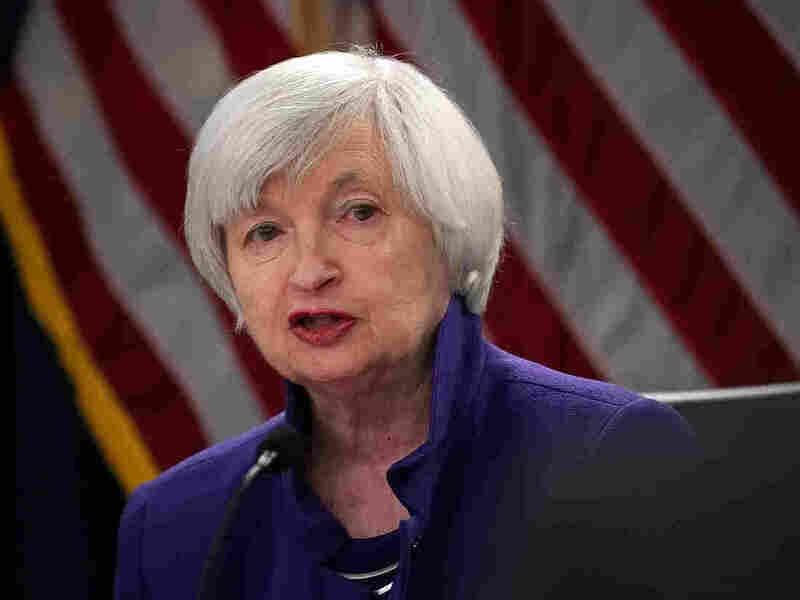 Federal Reserve Chair Janet Yellen, who will step down in February, has said she thinks the forces that have been holding inflation down are temporary and that she expects it will soon be on the rise again. For the third time this year and the fifth time since the financial crisis, the Federal Reserve has increased interest rates another quarter of a point. Fed policymakers on Wednesday announced an increase in the benchmark federal funds rate to a range of 1.25 percent to 1.5 percent, the third increase in the key rate this year. The move — which will mean higher rates on consumer loans, some mortgages, credit cards and other loans — indicates the central bank is confident in the strength of the economy and ready to push rates to more normal levels. In a statement, the Fed said the labor market has continued to strengthen and economic activity "has been rising at a solid rate. Averaging through hurricane-related fluctuations, job gains have been solid, and the unemployment rate declined further." Economic growth has been running at a robust annual rate of just above 3 percent during the spring and summer. The pending GOP tax overhaul being hammered out in a House-Senate conference committee is likely to provide additional stimulus in 2018 that could boost growth even more. That's led some Fed officials to suggest that the central bank may want to pick up the pace of its rate hikes to prevent faster growth from igniting more rapid inflation. At a Wednesday afternoon news conference, her last as Fed chair, Janet Yellen said the proposed tax cuts would provide a "modest lift" to economic growth in coming years and should boost consumer and business spending. Yellen said tax policy was up to the White House and Congress and that the Fed's job is to focus on monetary policy. Nevertheless, she noted that the tax bill is expected to increase the national debt relative to gross domestic product, adding that she is "personally concerned about the U.S. debt situation." Updated economic forecasts from Fed officials released Wednesday suggest the Fed will raise rates three times in 2018. That's no change from their previous forecast, even though their forecast shows faster economic growth next year. Over the past two years the nation's central bank has been gradually hiking its benchmark interest rate from a near-zero level. The fed funds rate influences a variety of other rates that consumers and businesses pay throughout the economy. The Fed cut it to the near-zero level in December 2008 and kept it there for seven years in an effort to keep the economy on track after the financial crisis and ensuing recession. The rate hikes have come at a time when there is very little inflationary pressure. In fact, inflation numbers have been consistently undershooting the Fed's 2 percent target in recent years. Yellen will preside over one more meeting in late January and will step down in February. She has said she thinks the forces that have been holding inflation down are temporary and that she expects it will soon be on the rise again, given the economy's tight labor markets and improved growth rate. With unemployment at 4.1 percent and the economy growing strongly, Yellen and others believe that employers will be forced to pay higher wages. That could also motivate companies to try to boost prices, triggering higher inflation.